It is a crucial stakeholder meeting for your business today, and you are hoping to make the best impression possible on the potential clients and investors of your company in the audience. You have laboured for weeks getting the presentation and speech pitch-perfect, and you know you can nail it. Now all that is required is getting the show started. You ease in the captive audience with a strong introduction and hope to continue the same momentum and energy into your presentation too. And then you had to go and ruin the whole effect! Why? Because you are now running around getting the projector up, pulling down the white screen, switching off all the light switches (or worse, asking some of your audience to get that light switch at the back), utterly destroying the great momentum you built up to the presentation just now. Definitely not the best impression you wanted to make! Just imagine if you just had to press a button or two on a touch panel and lo! The lights get dimmed to an optimal level, a spotlight lands on the speaker, the whiteboard unfurls itself, and the projector is at the ready with your presentation! In my dreams, you say? In your reality, we say! Yes, that is right! 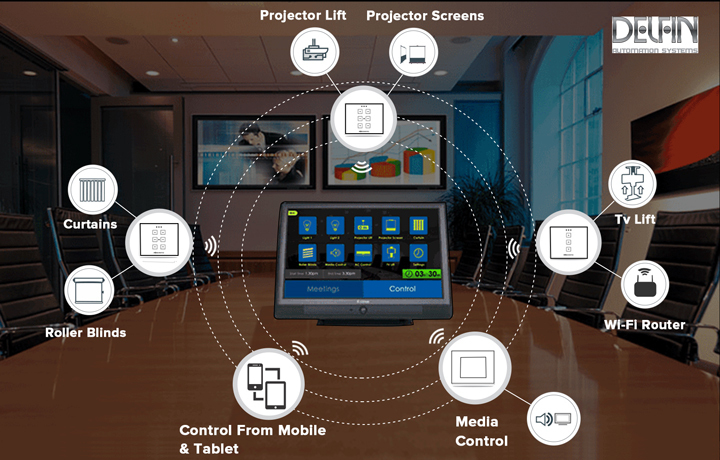 Welcome to the world of conference room automation system in Chennai! An Automated Conference Room System Makes The Best Impression! Many businesses and enterprises are opting for these state-of-the-art conference room systems and reaping huge benefits from their meetings. There is nothing like a slick and smooth presentation to instill confidence in clients, investors or any other stakeholders about your company. An automated conference room goes a long way in achieving that. A smoothly operating conference system is almost like a symphony happening between the various automated elements in the room. This cool technology lends itself not just to the standard audio-video system but also the lights, the blinds and even the climate in the conference room, creating the perfect ambiance for pitching your latest ideas to a receptive audience. Conference System Automation Improves Productivity! In addition to making an excellent impression, automated conference rooms make for a more focussed and productive environment without any distraction due to logistical reasons. The speakers and audience alike are more attuned to the matter at hand rather than worrying about which switches turn off which lights. Some automation solutions also provide geofencing services as a part of their conference room packages if required. Geofencing is about creating a virtual perimeter around a designated area to monitor people or goods moving into or out of the area. It is typically used for maintaining security, but in a conference room setting, it is beneficial in preserving the confidentiality of the matters discussed in the meetings, especially those conducted in commercial spaces. If any files or data is shared inside the room, they are automatically removed from everyone’s phones or devices when they exit the premises. So, go out there and invest in a conference room automation system to create an impact on your clients and see it pay you back in no time with interest!